Today’s mapping resources as a result of high resolution satellite mapping are a modern wonder. The new information that these resources provide are invaluable to finding out what’s going on around us. Global Forest Watch is a new service that provides useful information about the state of the world’s forests, including our local forest on the summit. The map below shows an analysis of the reduction in forest canopy in the Donner Summit area since the beginning of 2012. This type of analysis is very useful for monitoring the health of a forest as well as increases and decreases in overall forest areas. Interestingly, there have been some large changes in our local forests as the map shows. Clearly there have been some large reductions in areas of the forest. 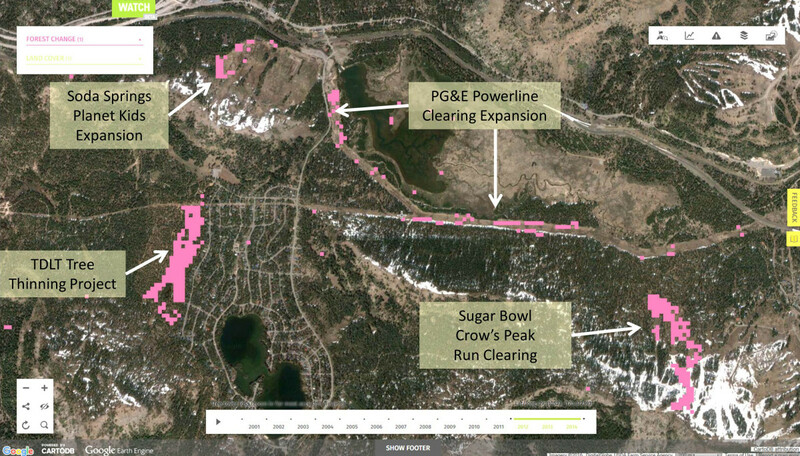 The forest thinning project in the Royal Gorge area to reduce wildfire danger is evident, as is the increased clear cutting that PG&E has done on their power lines to decrease the danger of wildfires due to power line failures. There are also significant reductions as a result of the Soda Springs and Sugar Bowl ski resorts expanding their operations. These types of tools will become even more valuable in visualizing the changes that will be occurring as climate change progresses and planned future ecosystem changes such as the removal of Van Norden Lake and wetlands are made in the area.